Matched is a dystopian series that I was excited to read. Normally all dystopian books have similar themes in them but it is still fun to see how each story adds their own twist to it. Excited to read the entire trilogy. I am beyond obsessed with Danielle Paige and her spin on the traditional Wizard of Oz. Husband is now reading them too which is very exciting for me because I like to discuss them with him. It's like a book club of 2. I have always wanted to be in a book club. I have always wanted to create a book club and actually have people want to participate. I just like books, o.k.? I must say I didn't like Barrel Fever very much. Written in his traditional sarcastic tone, this one just lost my interest. I can't exactly say what it was. I think it is because I enjoy his books based on his life more so than his short stories or essays. 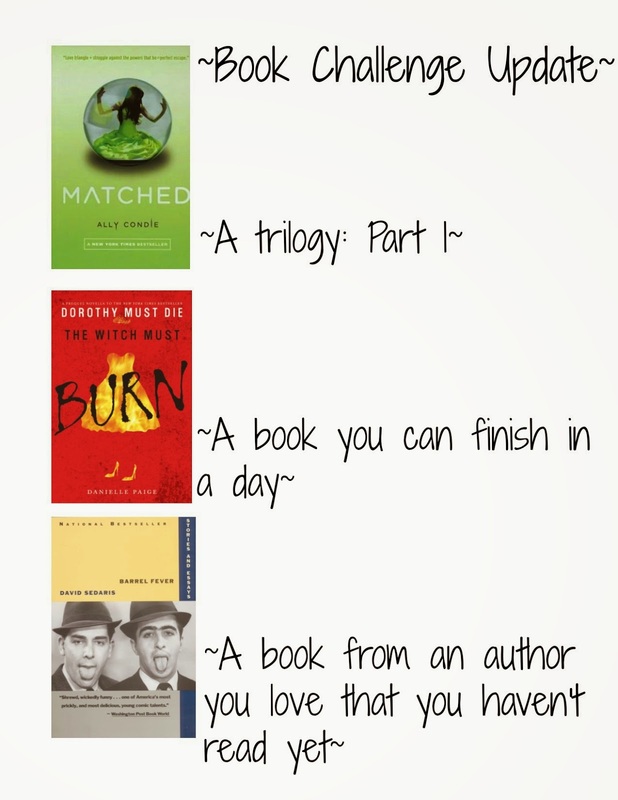 Let me know what books are on your reading list below and as always you can tweet me @lifeinmascara.